I saw a couple of tweets asking teachers how they plan their lessons, what is a typical lesson look like, what happens behind the scenes? I was keen to read people’s responses and then to be able to compare it to how I have been planning my lessons over the years. This blog post will outline the typical planning process and I will use an example: substituting fractions. Before I begin, I thought it would be useful to know that during the planning process I outline a progression model. I pick a topic that I want to teach, e.g. substitution, and I break down the topic into complex skills which I want to teach and form exercises which pupils will complete. Breaking down each skill into small component skills prevents pupils overloading their working memory during the initial stages of teaching new information. 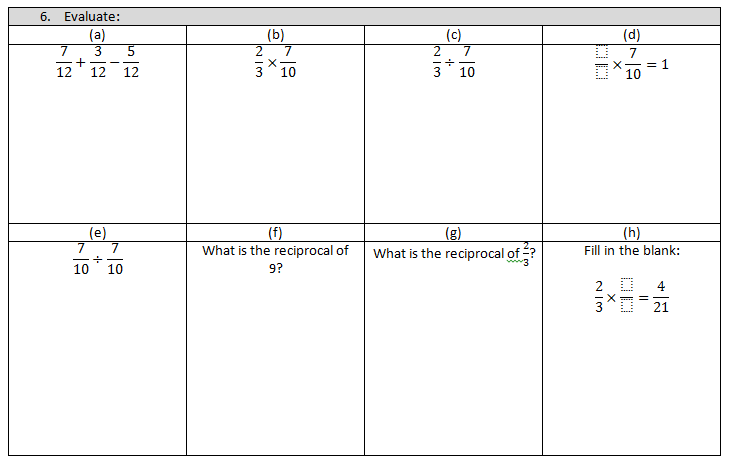 The start of every lesson I give pupils a selection of questions to recap what has been taught over the last few days. Pupils do this on their mini-whiteboards. This is a quick exercise taking no more than 5-10 minutes. The questions have been prepared in advance because I want to ask questions which really test a pupil’s understanding. There is no point giving pupils a question to do on their mini-whiteboards which they will all more definitely get right. You want to tease out any confused understanding or misconceptions that pupils may have. This is because if a pupil proceeds to learn new content with misconceptions in mind then more misconceptions will form, or become consolidated. I will think about the worked examples that I want to use to teach pupils how to substitute fractions in a manner which works for all problem types. Engelmann refers to this form of instruction as Faultless communication which I shall blog about soon. I try and design my teacher instruction so nothing that I say contradicts what I have taught in the past. Not showing these examples means that when pupils try the following questions then they will be freaked out by getting answers which are negative or zero or mixed numbers. The process of substituting fractions where you have to add or subtract fractions with common denominators is the same regardless of the question set up or the answer you get. After going through my worked examples, I will give pupils a very similar set of questions to attempt on their mini-whiteboards. Here pupils are showing their written work to maximise the likelihood of pupils creating perfect answers and working out during independent work. I put a question on the board; give pupils 30 seconds to complete the work on their mini whiteboards. They hold their mini-whiteboards with the answer hidden so other pupils can’t copy each other. I then ask them to show me all at the same time – 3, 2, 1 and show. This lets me see all 32 pupils’ working out. I will give whole class feedback over mistakes that I see. I will show the class a pupil’s work if it is excellent. I will show a sub-optimal answer too and stay ‘Jonny, would have gotten a merit if he had done this…’ or ‘Jonny can improve this. Who can help him improve this? Thank you for letting us all learn from your work Jonny.’ Doug Lemov goes into more detail about the effectiveness of Show Call in his podcast with Craig Barton. The purpose of this exercise is for me to fix any mistakes and close those gaps. Also, to identify the pupils who are still struggling and support them during the independent practice part of the lesson. I don’t usually have plenaries in my lessons. I plan my lessons so pupils can complete all the exercises, even more so the hard staff at the end that I want pupils to have the time to complete. I don’t use Exit Tickets because I do a weekly quiz which informs me of the same information that an Exit Ticket does. I think this approach is similar to many teachers. Nothing here is extraordinary but ordinary. However, what is most important to understand is that the typical lesson above includes features and details that allow pupils to learn, and more importantly it allows pupils to remember what they have learnt. Everything that I have outlined is a combination of what I saw as good teaching from my own education but also from what I have witnessed and learnt from many exemplary teachers that have kindly let me watch them teach. In my last blog post I discussed how curriculum sequencing underpins successful teaching of concepts. For examples, ensuring that pupils are able to add, subtract, multiply, divide directed numbers as well as raise a directed number to a power allows successful teaching of how to substitute directed numbers into expressions. The second aspect of good teaching is ensuring pupils are regularly given low-stake quizzes which test whether a pupil has retained the small body of knowledge that has been taught explicitly over a short period of time. This is possible through weekly quizzes. I learnt this good practice during my time at Michaela Community School, and it has been the second most important aspect of my teaching practice that has allowed my pupils to be successful in the classroom. The first being the introduction of in-house resources in the form of a textbook. Why are weekly quizzes powerful? I didn’t think of testing in this way when I started teaching. I thought testing was a form of dead time which took up lesson time. There is some grain of truth to this because you don’t want to occupy a large proportion of your lesson time to testing because you want to teach pupils new content. Activating the information in regular, spaced intervals. The recall process needs to be an active one where a pupil responds to a question rather than re-reading or highlighting. Every act of recall and review of newly taught information the stronger the memory traces become. The stronger the memory the longer you are able to recall the piece of information. Testing a pupil’s understanding of a concept by creating a variety of test items. The greater the variety the more that pupil learns to connect new information with what they already know. This improves a pupil’s ability to retain information. Equally, this is important because there is nothing more frustrating for a teacher, and a pupil, when a pupil has been taught a lot of information and then they forget it. This demoralises even the most competent of pupils to learn further. 1.The content of the test items has all been taught to pupils. Or pupils have been taught sufficient information to answer the question. For example, I didn’t explicitly teach this problem type below to my Year 10s or Year 9s because I wanted to see if they could do it themselves given the information they already had. In both classes 95% of pupils were able to do both questions correctly. This lets me know which pupils have made the most mistakes, which pupils have been the most successful, if I need to reteach a particular concept that the whole class has misunderstood or that I haven’t taught well. The pupils have teacher feedback to act on so when they are revising for the quiz the following day they know what they need to revise over. They understand their mistakes and they know how to avoid making those mistakes again. The following day pupils are given the same quiz but with different numbers. They complete this in exam conditions where I invigilate to ensure pupils don’t speak or cheat. This works because the test items haven’t changed. I have changed the numbers that the pupils will substitute but the problem types are the same in the real quiz and practice quiz. The test has stayed constant so I can infer a judgement on pupil performance. You can’t compare test results when the quiz continues to change. Keep as many test variables the same, so the only variable that is measured is a pupil’s performance. From the data set of the most recent weekly quiz my Year 9 Set 2 did I can then make the right judgement about each pupil’s performance. What makes this practice difficult? It depends on how many lessons you have with that class because you do need time to teach the curriculum and do both a practice quiz with feedback to give, and time for another quiz. I am very lucky to have about 5 lessons per week with my classes, and some double lessons too. If you teach five year groups then it can be hard as a single teacher organising these quizzes. If this became a whole department policy then it would be best to have one teacher designing the weekly quiz for one year group. This is manageable. If one teacher makes the quiz catering for all ends then each individual teacher can edit to make it suitable for their classes. I have only been at GYCA for a half term, but the quizzes are informing me of how I can improve my teaching, how clearly pupils understand what I have taught them, how flexible their knowledge is and how well they are retaining what they have been taught. The kids love seeing percentage scores in the 80 – 100% range. Pupils love seeing the success of their hard work. It motivates pupils who want to learn more to be able to do so because they have been told (a) what to learn and (b) how to do it too. It also gives pupils who are lazy or find maths difficult guidance on how to improve. I am looking forward to seeing the kids’ faces on Monday morning when they get their quiz scores back. Lots of them will be beaming with pride. After October Half term, I joined Great Yarmouth Charter Academy. I was given the task of teaching Year 10 Set 5 out of 6. The first topic I was assigned to teach them was substitution to then go onto teaching expanding brackets. I planned two booklets to teach both topics. I then realised due to a lack of prior knowledge, what I had prepared was out of their reach. I went back to the drawing board to teach the topic of directed numbers. This blog post is a reflection on what I saw to be effective teaching of substitution purely because of how the prior knowledge required was sequenced before teaching substitution. For the first lesson on teaching how to add and subtract negative numbers with no double signs, I had pupils completing exercises of one problem type. This was to help pupils recognise a pattern which I later shared. Pupils did lots of questions where they practised moving up and down the number line before hand. Similarly, this also applied when asking pupils if the result when a negative number is held to an even or odd power would result in a positive or negative number. After the starter of my lessons, the next 5-6 minutes I would ask them the same questions on a daily basis, change the order of the questions which was important to ensure that pupils were made to think. 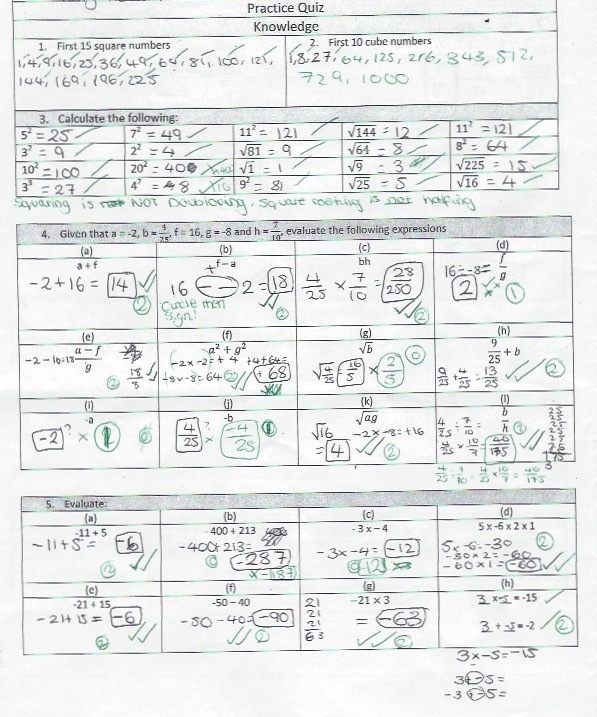 Similarly, I used the same problem types each day but would change the numbers. If the numbers are going in the same direction then what do I do? This was because I wanted pupils to have absolute clarity over what they needed to do, and with a variation different phrases for the answer and being verbose would have confused them. Also, the repetition helped pupils see specific patterns e.g when we have the following problem types -5 – 6 we add the values of 5 and 6. When I have found the difference, will my answer be positive or negative? ANS: The larger value is negative so my answer is negative. What are the two things do I ask myself when I see this question? Why was the re-teaching of directed number crucial? Pupils were to attempt the following exercises. It is very early days but they are very comfortably learning how to substitute negative numbers. We will be learning how to multiply a constant and an expression, next week. 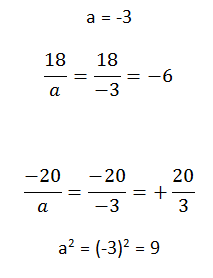 The teaching of directed numbers will support the pupils particularly when attempting the following problem types. Thank you, Siegfried Engelmann. Thank you.